I have Google Alerts for everything. Whenever an article is posted with terms like “flying car,” “time capsule,” and yes, “hoverboard,” I get a notification. But today I can call my Google Alert for “hoverboard” officially worthless. Just take a look at this story from The Irish News. How exciting! Inventors finally made the hoverboard we’ve all been waiting for! Too bad they got seized at the border going into Ireland. But I’m sure it’s all part of some big misunderstanding. Those hoverboards will be zipping lucky Irish people around in no time once they get through customs! MORE than 1,000 Back To The Future-style hoverboards have been turned away from Ireland over fears they could burst into flames. The consignment of two-wheeled hands-free electric scooters, which are a big hit on Christmas wish-lists, was seized at Dublin Port. The self-balancing gadgets, used by celebrities like Lily Allen and Jamie Foxx, can cost upwards of €350 and have already been banned in a number of cities worldwide. While they haven’t been outlawed in Ireland, authorities grounded 1,400 so-called Smart Balance Wheels over “significant safety concerns”. I had to triple check that The Irish News wasn’t a parody site. Because even though it’s not at all funny, sometimes the business model of some garbage sites out there is the dissemination of fake news. But, alas, this one was legit. 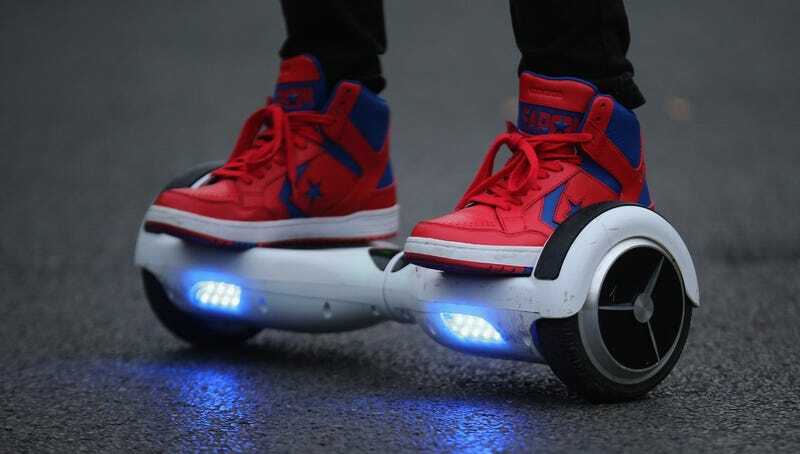 The term “hoverboard” is officially just what we’re going to call these things now. They’re essentially Segways without handlebars, and cities are scrambling to figure out how to regulate them. We can scream all we like about how they’re not hoverboards. But that’s what people call them. There’s no sense in fighting it anymore. News articles are even claiming that these two-wheeled self-balancing boards are Back to the Future-style. Which, of course, is false. Not to mention the fact that hoverboards don’t show up until the sequel, so if you’re going to say they’re from Back to the Future, you should be more specific (*snorts, pushes up glasses by the bridge with two fingers*). But none of that matters now. What matters is that we fully surrender to the term. That Back to the Future II-style hoverboard you’ve been waiting on since 1989 isn’t coming any time soon. Just climb aboard the unstoppable freight train that is our modern lexicon. You can lay down on the tracks all you want, but that train — a train likely filled with hoverboards that don’t hover and will be banned by countless municipalities before Christmas — is just going to run you over. RIP hoverboards. Long live hoverboards.